Many a times during Data Migration, we encounter a need to delete all customers/vendors and reload them. But in AX 2012, Customer and Vendor entities have a lot of tables which can contain their related information like addresses, party, location, electronic addresses etc. The below code will help you in such scenarios to delete the customer/vendor completely. 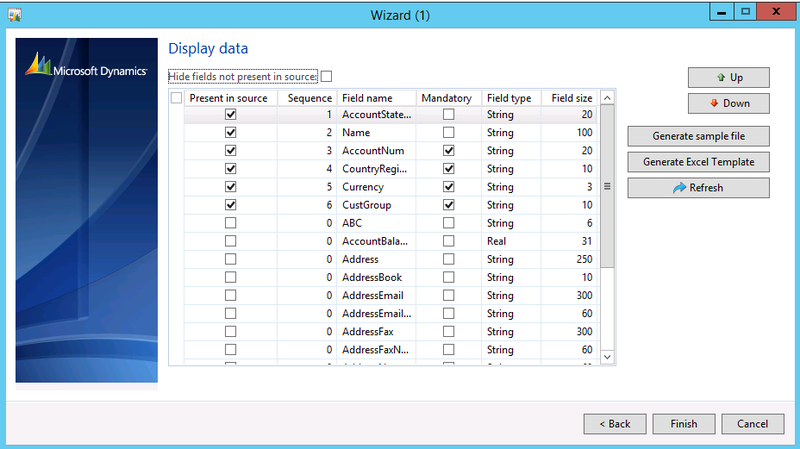 I have encountered scenario where I need to load data into AX 2012 using fixed field txt files from legacy system. I used DMF to upload the data. The catch is the fixed field txt file upload is different from the regular csv or excel file upload in DMF. The file format settings will be as follows. Here we need to perform additional steps to mention the field lengths of various fields and make sure they stay as-is post mapping them to the staging fields. Once we create the Processing group, Entity record for the required Entity and file format as the one created for Fixed field file, click ‘Specify File Format’ button and click next. Remove all the field list and add manually the fields from the way they are coming from the fixed length file and also mention the field lengths of the fields. Select the file path where the file for upload is placed on the file system. Click ‘Modify Source Mapping’ and map the fields mentioned in the mappings sheet ‘FileToStagingMappings’. Once done make sure that the field lengths stay same as above by running the ‘Specify file format’ wizard and selecting ‘No’ in the dialog box. to start the data load. Till AX 2012 R2, the Generate methods in DMF entity classes do not have attributes. These were identified by the field groups with names starting with Generate. In AX 2012 R3, the Generate methods of entity classes need to have the Attributes mentioned so that they will be recognized in the Target entity mapping. And there is no need for us to create the field group with <<Generate method name>>.